DOMESTIC SNAKES at the Capital Fringe Festival - karinabromaitiss jimdo page! Here's my first attempt at blogging. We're having a great time in rehearsal. Photos by our most wonderful stage manager, Mandy Yu are posted too. We're figuring out fun stuff, like using gloves to keep the skin on Lindsay's wrists intact while she flies around in the ponytail rig! I've also posted our press release. Since I'm so new at this (yes I am even after all these years-I've lucked out and someone else usually handled it! ), if you have any ideas for info dissemination, let me know. Thanks! See you at the show. Only 2 more weeks! More rehearsal news to come. Domestic Snakes-the second generation. Twenty years after its premier, Domestic Snakes is back with new material, and a new performer. Lindsay Abromaitis-Smith, the daughter of the show’s original creator and performer has how taken up the snake wrestling. Takoma Park, MD: Karin Abromaitis, long time Takoma Park resident and her daughter, Lindsay Abromaitis-Smith are teaming up to present Domestic Snakes at the Capital Fringe Festival. Domestic Snakes, a solo performance piece, is a collection of stories-some true, some from fairy tales and the mythological past about women’s hair. 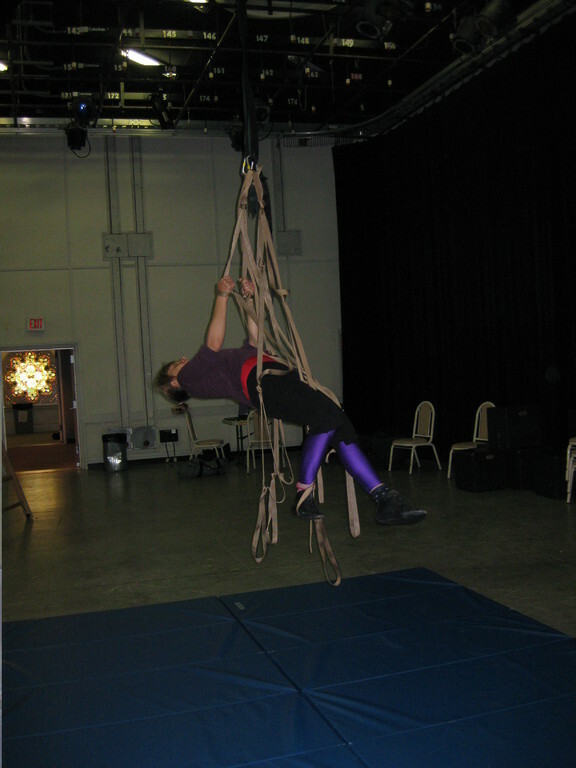 The show uses spoken word, aerial work and maybe some puppetry. What makes Domestic Snakes unique is its mother-daughter production team. Domestic Snakes is totally reconceived for a second generation of performance. Originally created and performed by Karin Abromaitis, her daughter, Lindsay Abromaitis-Smith was deeply influenced by her mother’s obsession with Domestic Snakes over 20 years ago. Now Lindsay is performing Domestic Snakes from her own unique point of view, through the lens of her own work as a performer, visual artist and animator of objects. Written in a fevered frenzy in 1988, and then refined and edited over many months, Domestic Snakes was first performed at Joy Of Motion dance studio in Dupont Circle in 1989. After a presentation of a part of it at the Mid-Atlantic Movement Theater Festival at Towson State University in 1990, faculty member, Tom Cascerio asked to direct. More months of editing and rewriting resulted in productions in 1991 at Towson State University’s Studio Theater and University of Maryland’s Pugliese Theatre. 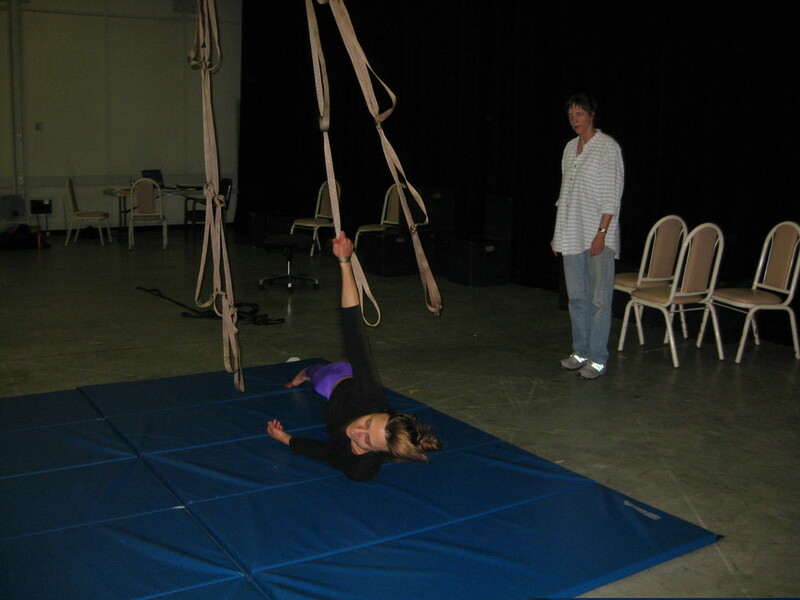 In 1992, Abromaitis was invited to perform Domestic Snakes at the Theatre Project in Baltimore and at Horizons Theatre’s Going Solo Festival in 2004. Lindsay Abromaitis-Smith is a Brooklyn based artist and physical performer. 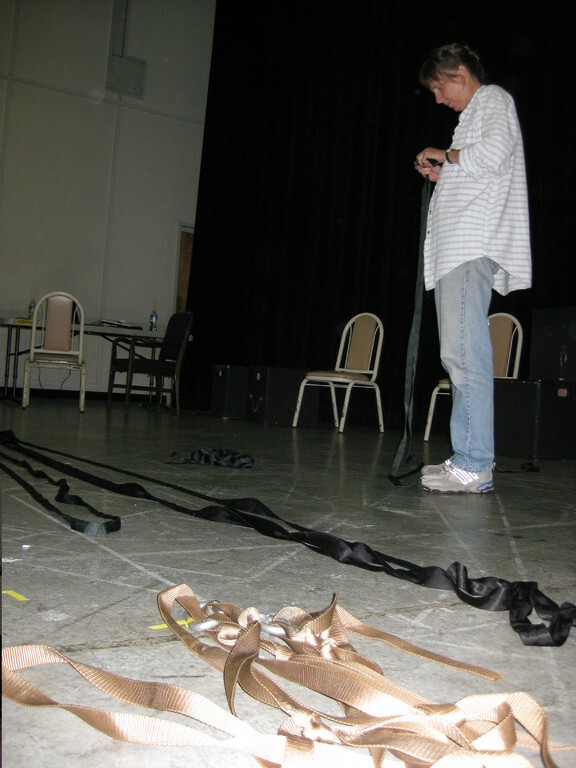 She has been working predominantly with puppetry as a performer, choreographer, teacher and builder. She began her study of puppetry with Alain Recoing in Paris, France. Since moving to New York City she has participated in a wide range of projects, including working as a puppeteer in Basil Twist’s Arias With a Twist, Mabou Mines’ Peter and Wendy and David Michael Friend’s Moonfishing, doing puppet design and choreography for Nu Dance Theater’s Elle d’Elles and Montgomery College’s Butoh Macbeth, and teaching both children and adults across the East Coast and Midwest. When not puppeteering, Lindsay keeps her hands busy with massage therapy and playing in the dirt. She is also an amazing kazoo player. Karin Abromaitis is a director; performer; movement, fight and dance choreographer; teacher, and potter. 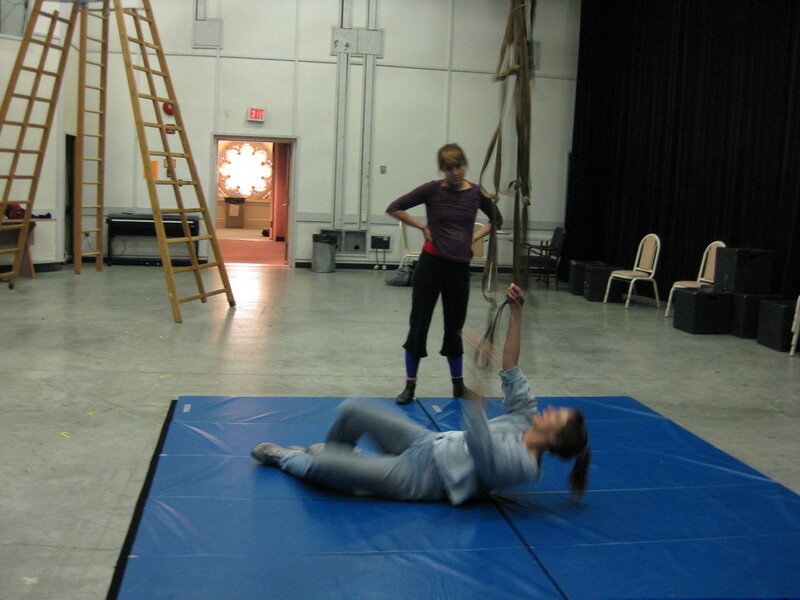 Her classes in physical performance skills for the actor are presented regularly throughout the DC metro area. She is currently on the faculty of George Washington University, and has taught for many years at Georgetown University and the Theatre Lab, and traveled around the country leading teacher workshops for the Kennedy Center from 1999-2007. 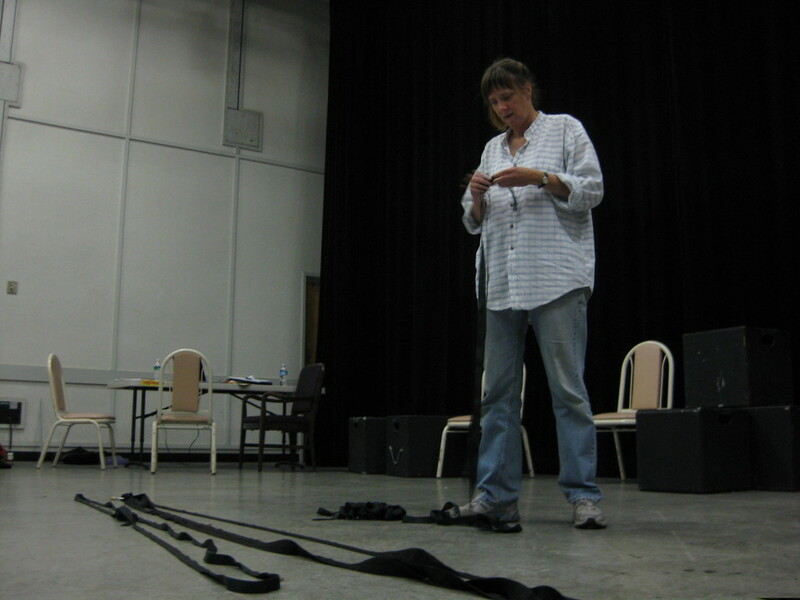 Karin has directed and done movement consulting, coaching and fight choreography for many area theatres, including Round House Theatre, Theatre J, ACTCo, Adventure Theater, YPT, Tsunami, Woolly Mammoth, and Imagination Stage. Recent directing credits include Butoh Macbeth and The Marriage of Bette and Boo at Montgomery College, Go Dog Go at Adventure Theater, How I Became a Bennington Girl by Sidra Rausch for Washington Women in Theater, and The Search for Odysseus for Imagination Stage. She also consulted on the staging of Porcelain for Tsunami Theater, which received a Helen Hayes nomination. Favorite fight choreography includes: Gris Gris with ACTCo., Big Love and Hamlet, at Georgetown University and Love of a Nightingale and Shakespeare’s Dog at George Washington University. Awards received include the Mary Goldwater Award for Idioglossia, as well as other awards for her solo Movement Theatre pieces: White Noise/2, White Noise/3, and Domestic Snakes. Getting closer to opening! Yay! Ayun Fedorcha, our lighting designer came for a peek. She has an apprentice for the summer-Lillian-she will be a fantastic help. The new set or apparatus is done. Still needs a bit of tweaking-lots of tangles. I wonder what conditioner will work best?! Lindsay experimented alot trying to see what the new ponytail will do, very fun stuff. Even got more video clips. Now I find out that I'm probably not doing this blog thing right. Maybe soon though. looking forward 2 seeing your opening 2 nite! "2 Shows: DISORDER / PLANT PSYCHIC"
"Clutter Hoarding ==> Utter Chaos." Sehr interessanter Eintrag, hier schaue ich doch immer wieder sehr gerne vorbei.